Driving from Milan to Bolzano took me around 3 and a half hours and that meant it was already past sunset when I arrived at the Four Points which is located out of town. 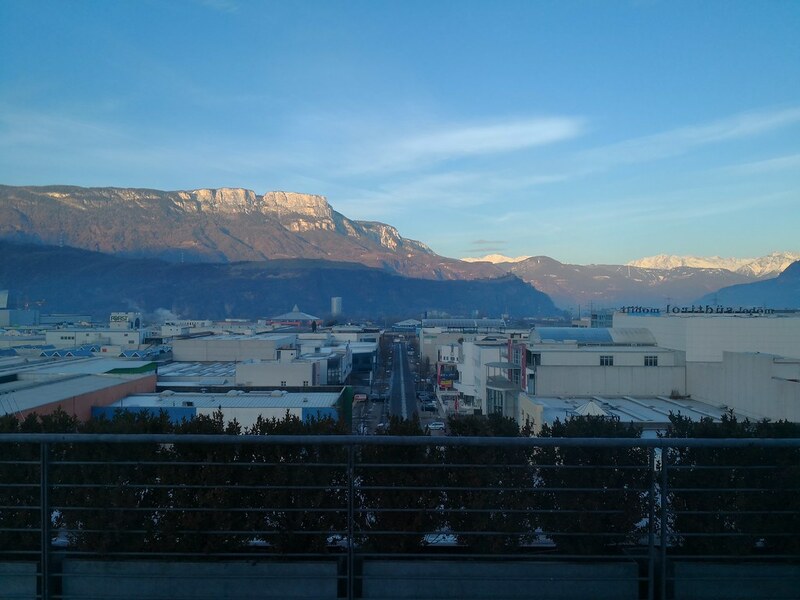 It is however close to the highway exit and near the Bolzano Trade and Convention Center making it more of a business hotel in the newer district of the city. Spotting the hotel is easy from the distance as it has a large ‘Hotel’ sign on its roof and is the only large hotel in the vicinity. 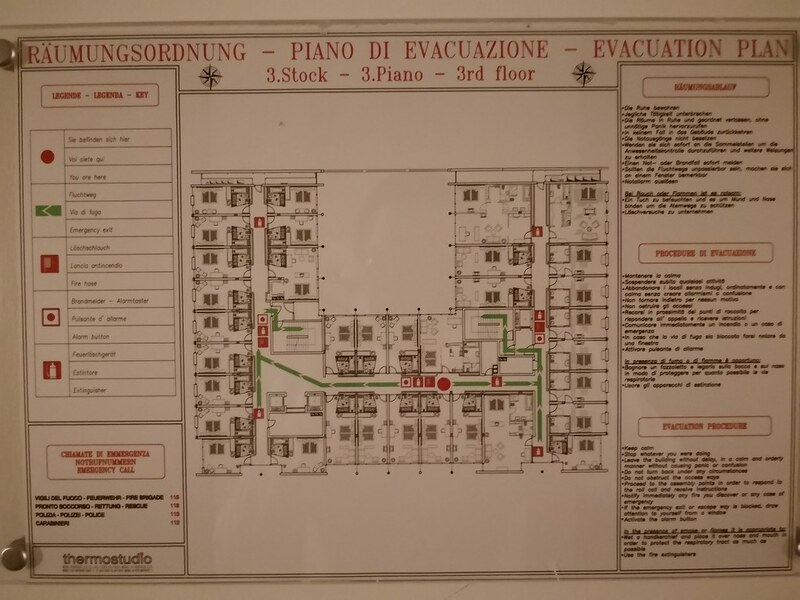 There are some commercial areas around the hotel but the sights of the city is a train ride away, as the hotel is connected to the Bolzano Sud (South) station. Guests driving to the hotel can park at the underground garage for a fee or along the roadside for free. There are plenty of car park spots around the hotel for guests wanting to save money though during the peak convention season, getting a spot to park around here might be difficult. 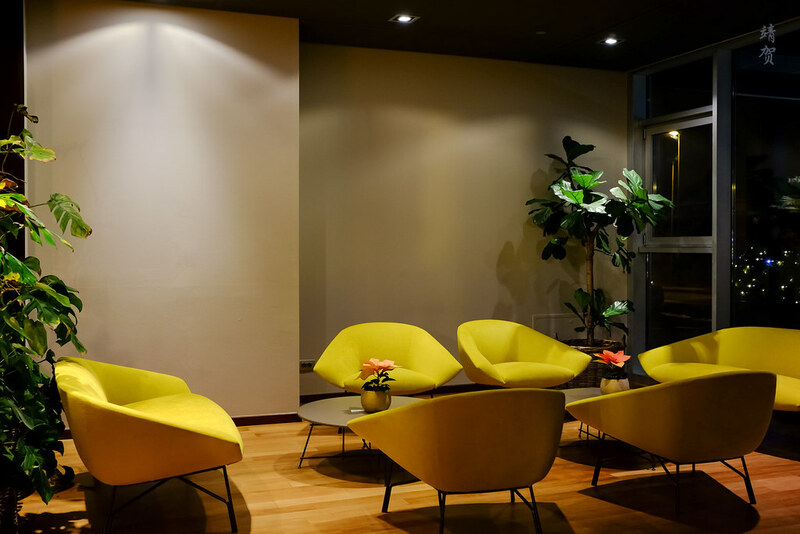 With a drop-off porch, guests can unload their luggage in comfort at the hotel entrance, from where they would enter a large and spacious lobby with plenty of seating. 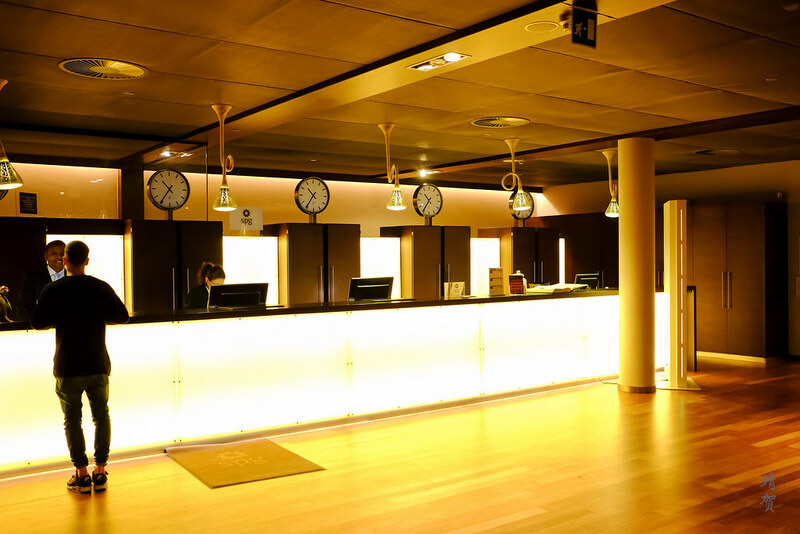 The hotel’s reception desk is lit up below which means it is highly visible even at night when the lobby is somewhat dark. As a Category 1 property, a free night here costs only 3000 Starpoints while rates are around EUR 110. This made me redeem the points for my 2 nights stay. 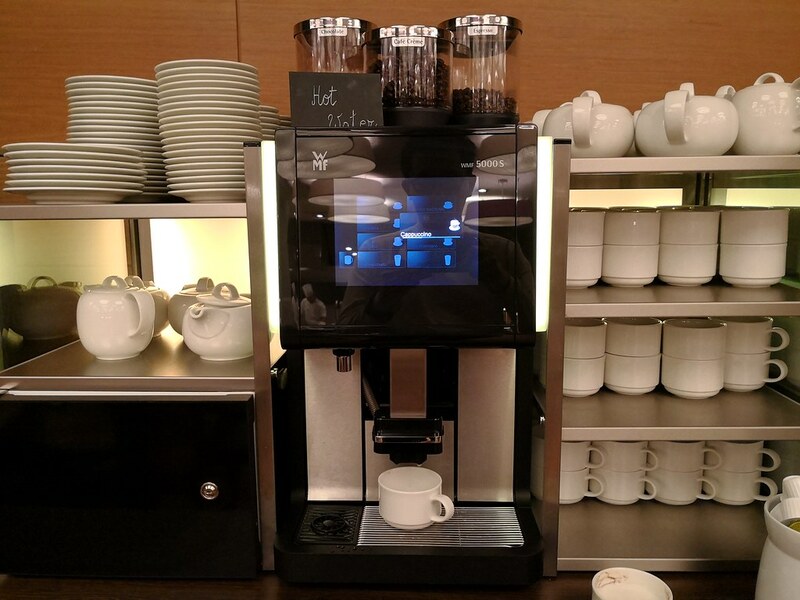 Check-in was conducted quickly and I was provided breakfast vouchers as a Platinum benefit. Front desk agent was quick and efficient though he did not mention of the upgraded rooms and neither did I ask for one since I was not expecting much in a Four Points hotel. Pleasantly surprised to see that I was assigned a nice large suite that is still close to the elevators. 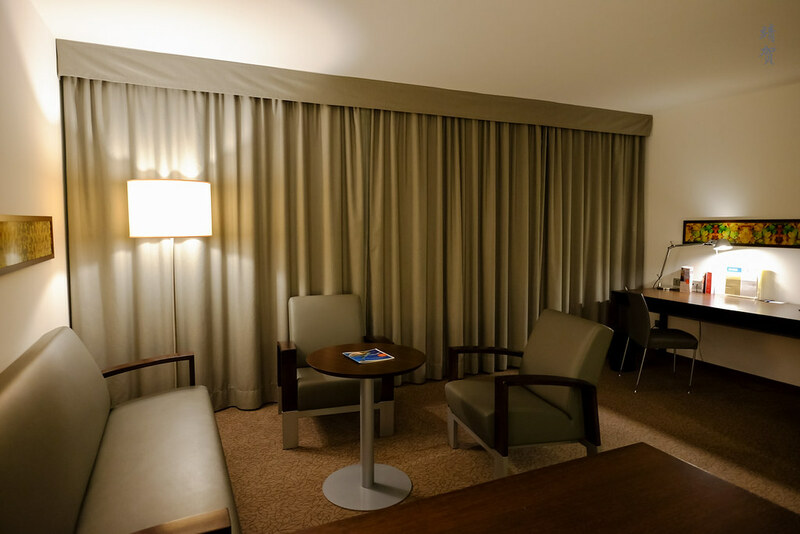 If you notice from the floor plan, there are several suites on each floor so SPG Platinum can expect to be upgraded to these suites when there is availability! On the right there is an open closet with a coat rack just beside the door. Across from the open closet was a walk-in closet that provides lots of space for longer stays. However the walk-in closet area has a motion sensing light which means it turn off automatically and that is irritating as it will turn off halfway when you’re searching for stuff in the closet since this is most likely where you would place your luggage to hide the mess from the rest of the suite. 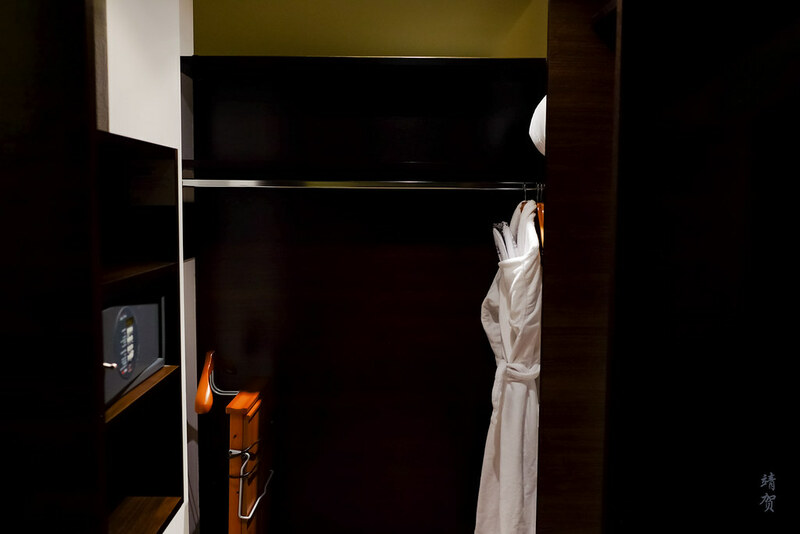 Inside the walk-in closet, guests would also find the familiar hotel safe, a wooden suite and pants hanger and an ironing board. Bathrobes, slippers and extra pillows could also be found here. 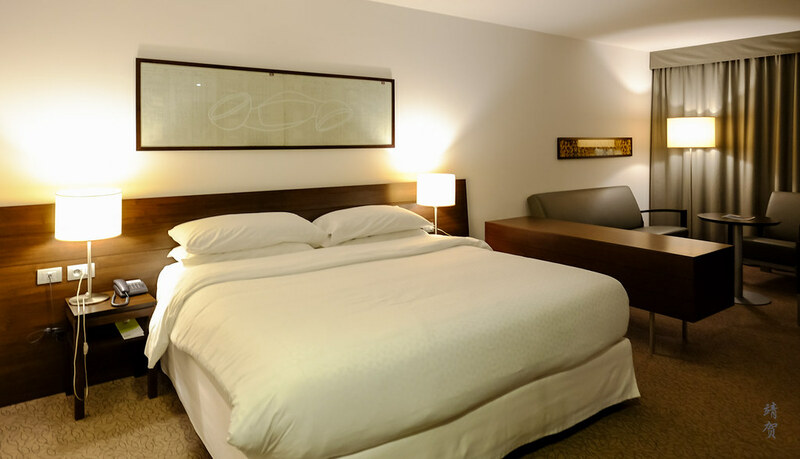 Inside the bedroom proper, there is a king size bed with small bedside tables. The King sized bed was large and definitely can sleep 2 adults comfortably. The bed was medium in firmness and not too soft or springy so I did have a good night’s sleep in them but I do sleep fine in most SPG properties. On the side of the bed was a long cabinet that created a demarcation with the living room. While large in size, the suite has an open layout and the 3-seater sofa and 2 armchairs are easily visible upon entering the suite. Personally I felt the layout would be far better had the sofa and bed switched positions, making the bed closer to the window side and more secluded from the entryway. Hidden from the foyer of the room is a large work desk though the area is somewhat desolate and dark to be conducive for working in the evenings. There was also plenty of open space in the suite which certainly helps for longer stays and I appreciated the space for storing my ski bags which I had brought along. Room has a view of the atrium which means it is not bright either inside the room with the curtains open. This view though makes the room quiet even in the daytime. After all the short stature of the hotel surrounded with nondescript office/industrial buildings means street side views does not count for much. Doors to the bathroom is found between the closet on the right side of the entryway. For a suite, the bathroom was a respectable size and the white tiles makes it bright and nice for a shower. 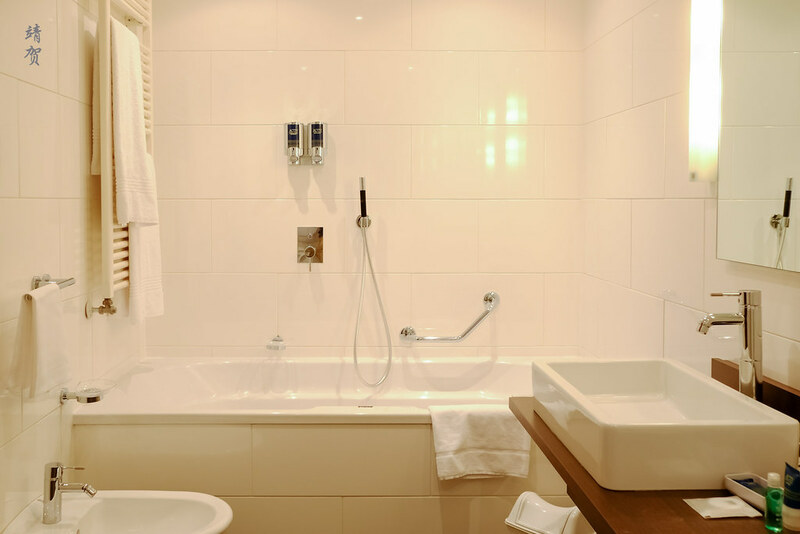 A bidet is also found beside the bathtub on the left of the bathroom with a modern sink. 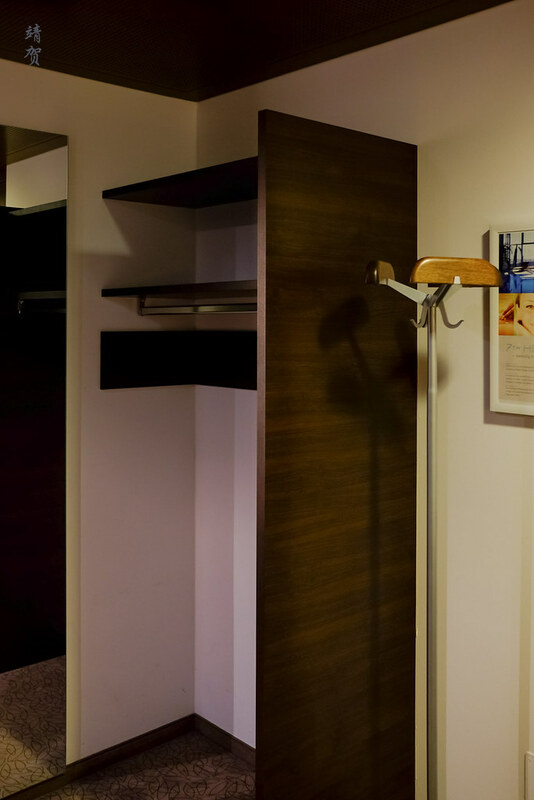 Heated towel racks are also found by the wall, an indication of the hotel as a cold winter destination. On the right side of the bathroom was a shower enclosure fitted with handheld shower head and fibre-glass sliding doors. A new toilet fitting is found beside the shower stall with wall mounted flush controls. Like all Four Points properties, the bath amenities are wall mounted and not on individual packaging. This did not bother me as I usually bring small personal bottles with me nowadays. 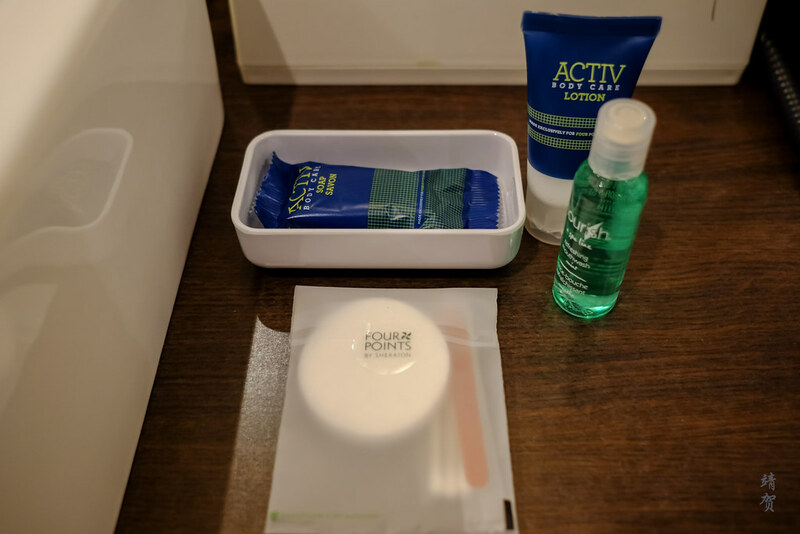 As a Four Points, there was a good range of toiletries provided which includes a vanity kit, soap bar, individual bottles of mouth wash and a body lotion on the countertop. It is also worth noting a telephone can be found inside the bathroom for convenience. 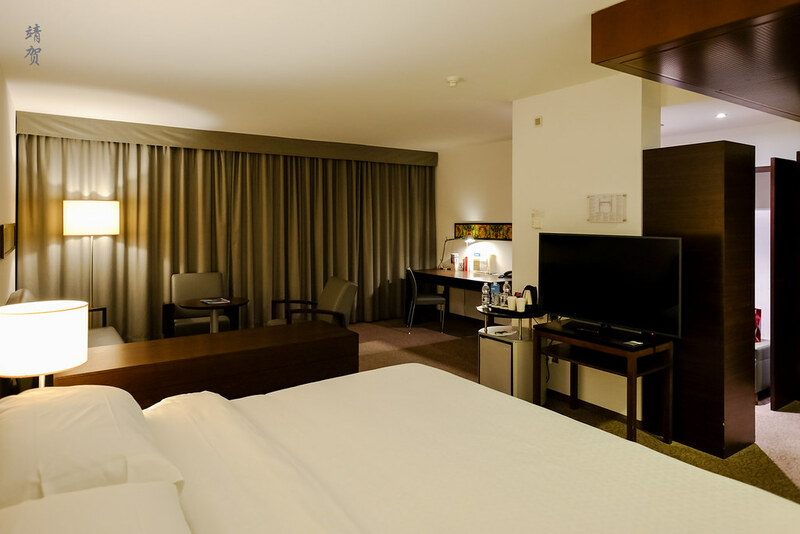 Since the bathroom has both a shower and bathtub and the rest of the suite was spacious and the bed was comfortable, I was pleased with the assigned room for my accommodation. Breakfast is served from 6:30am in the morning in Bistro 35 by the lobby and there was cards where guests with breakfasts could present to the staff though I did not find the staff was actively collecting them. This was one of 2 restaurants in the hotel on top of the bar, with the Patio Restaurant underneath the glass atrium being a venue for finer food in the evening. 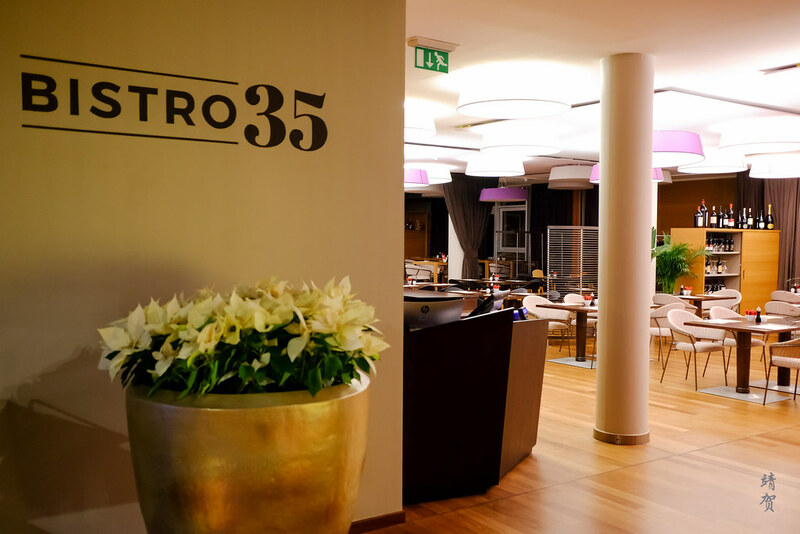 Bistro 35 is itself a nice restaurant with modern furnishings and a clear layout. 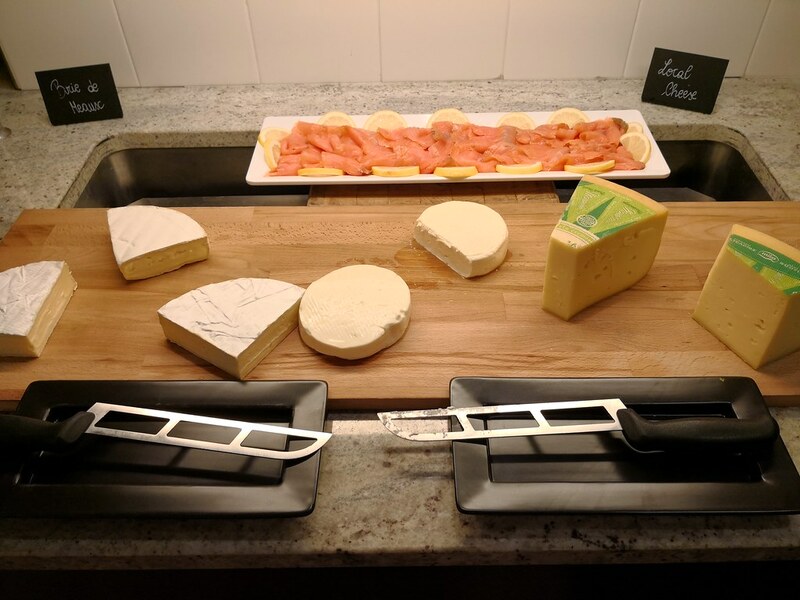 Food variety was excellent as well for the breakfast buffet that was complimentary for SPG Platinum guests in lieu of the bonus points. 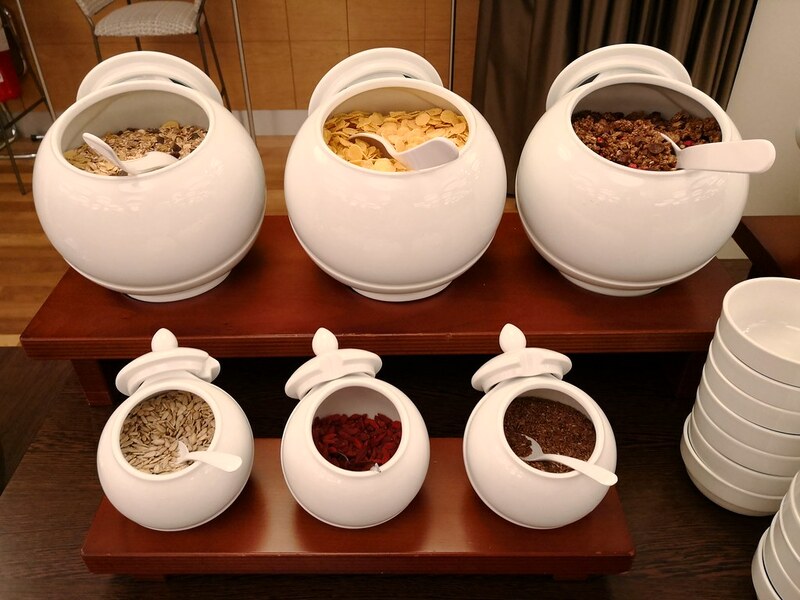 On the buffet counter, diners could find jars filled with granola, dried fruits and nuts. 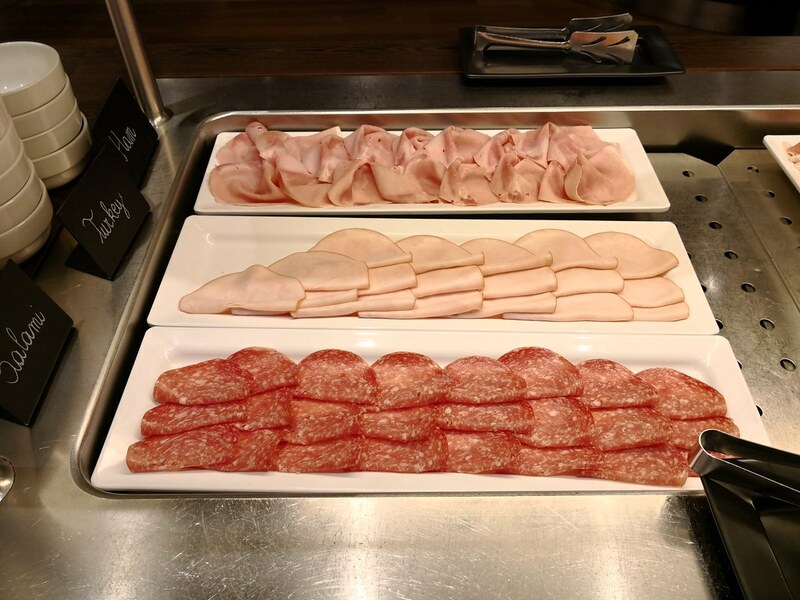 The main buffet section in the middle is where assorted cold cuts and smoked salmon could be found. Local cold cuts like Tyrolean speck and local cheeses are also available. 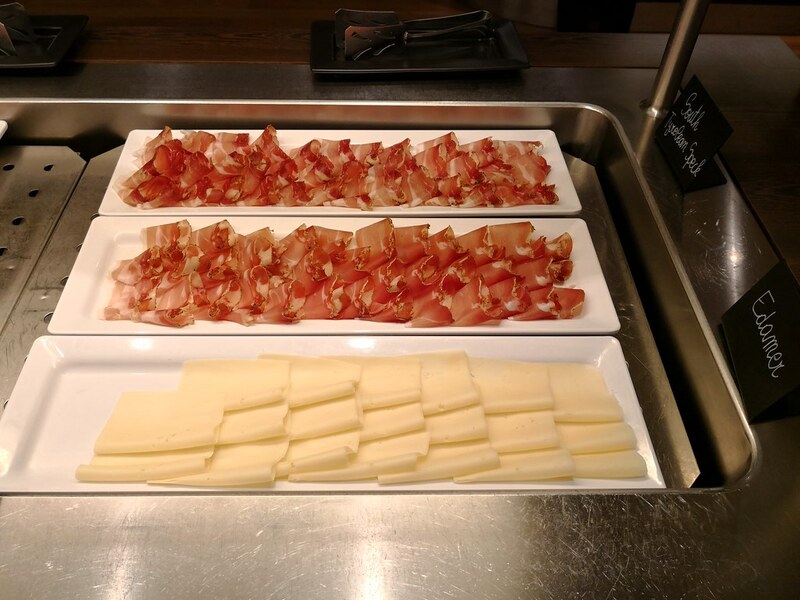 For those who have not had speck, it tastes like prosciutto and can be enjoyed with cheese and inside a sandwich! There are also assorted yogurts on large bowls, bircher muesli, sliced cucumbers and paprika on the end. 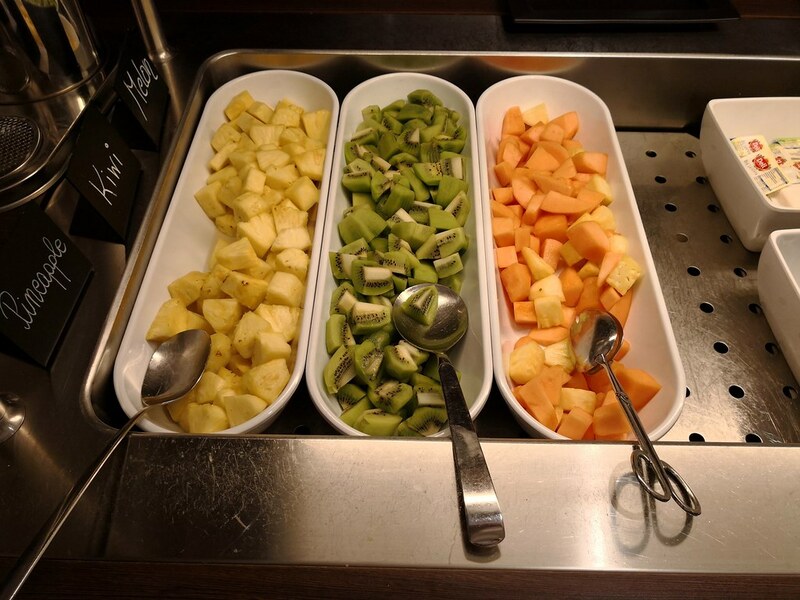 Cut fruits are available as well in the middle buffet counter. 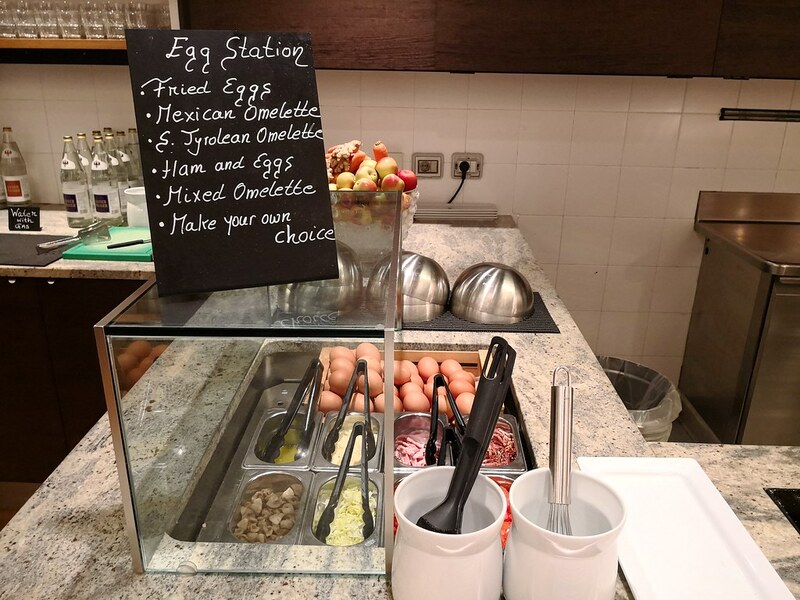 Beside the buffet counter, there was an egg station where diners can order eggs cooked to their preference with many of the common toppings for omelettes. 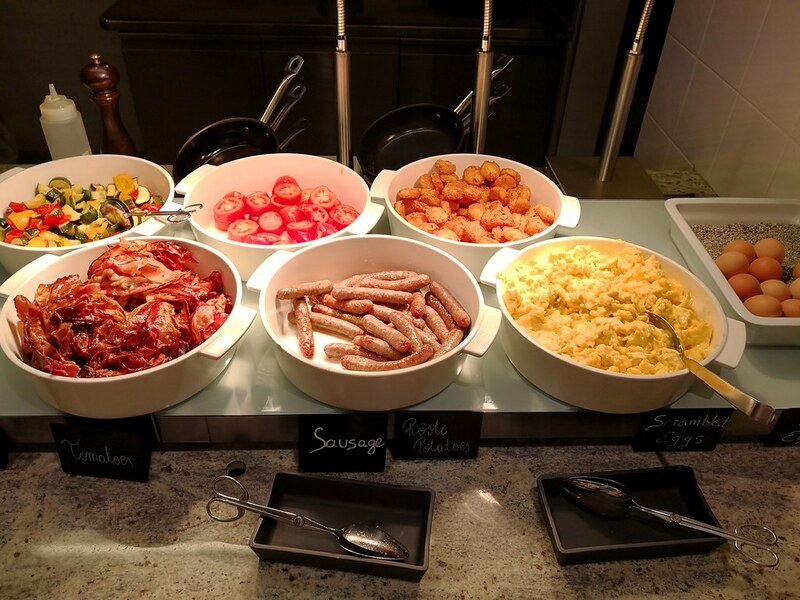 Beside the egg station was several choices of hot cooked food like bacon, sausages, scrambled eggs, mixed vegetables, tomatoes and rosti potatoes. 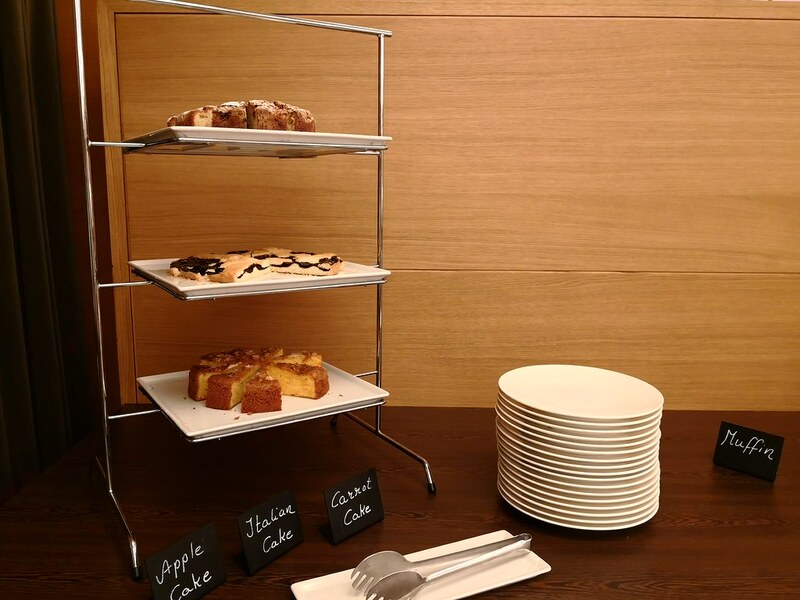 On the other side of the buffet table near the espresso and tea counters are the trays filled with cakes, muffins, croissants and other pastries. 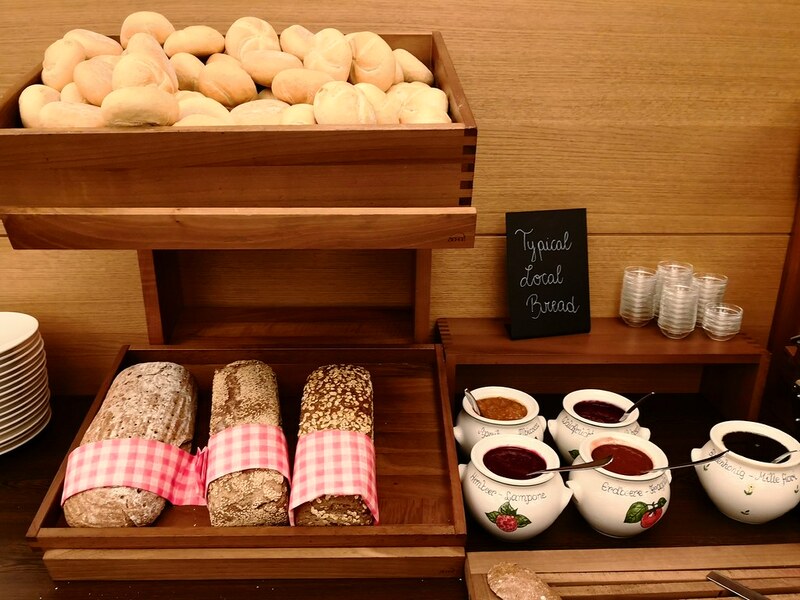 A variety of local bread with preserves are offered as well with white toast. 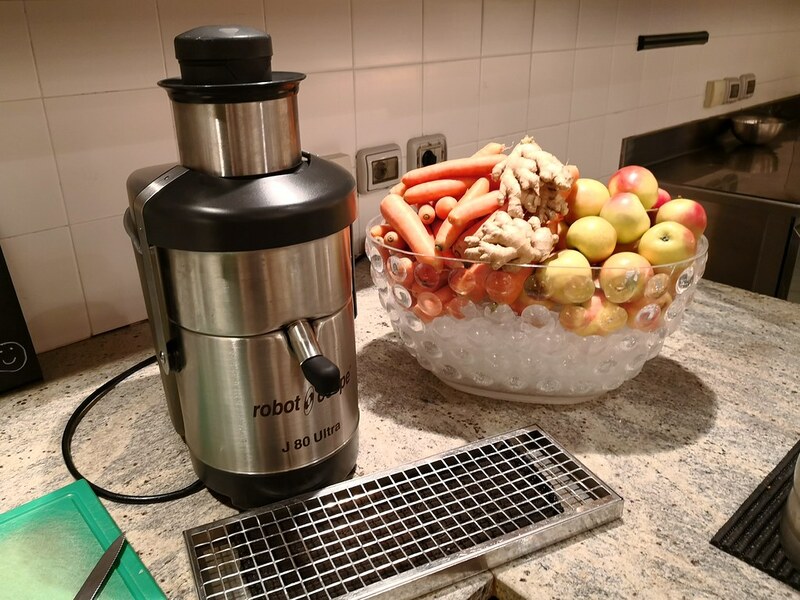 For beverages during breakfast, a juicer can be found beside the egg station with a huge basket of carrot, ginger and apples. 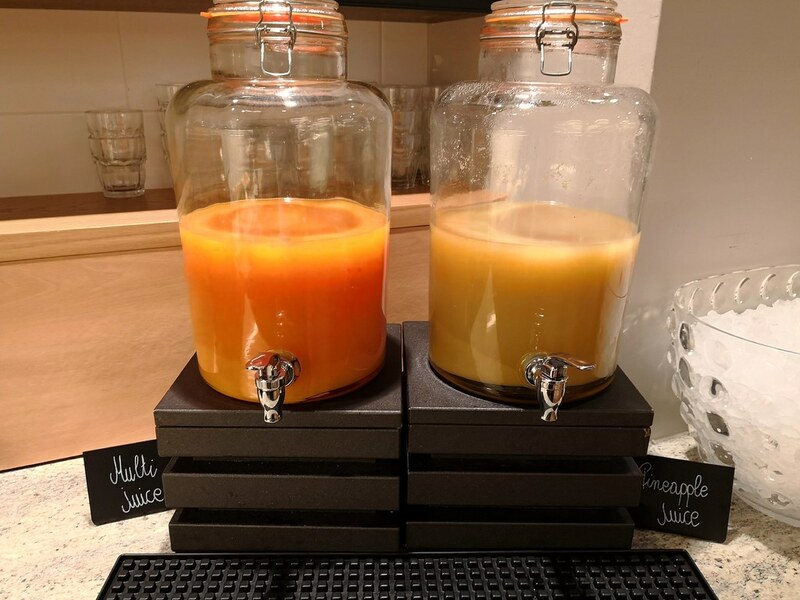 This section includes a cutting station so diners could create their own fresh juice and I like this feature a lot since pre-packaged juices tend to be overly sweet and full of sugar. 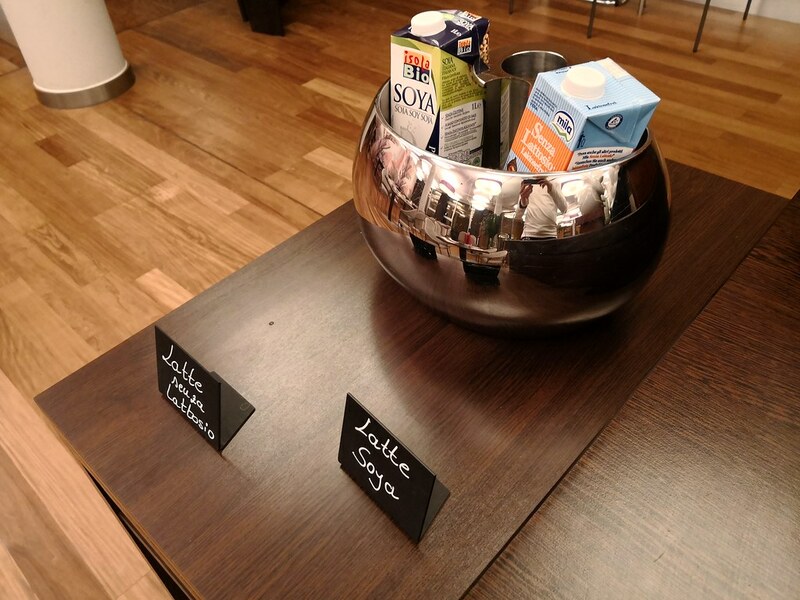 Naturally, they still provide multi-juices, pineapple juice, orange and apple juices for convenience. 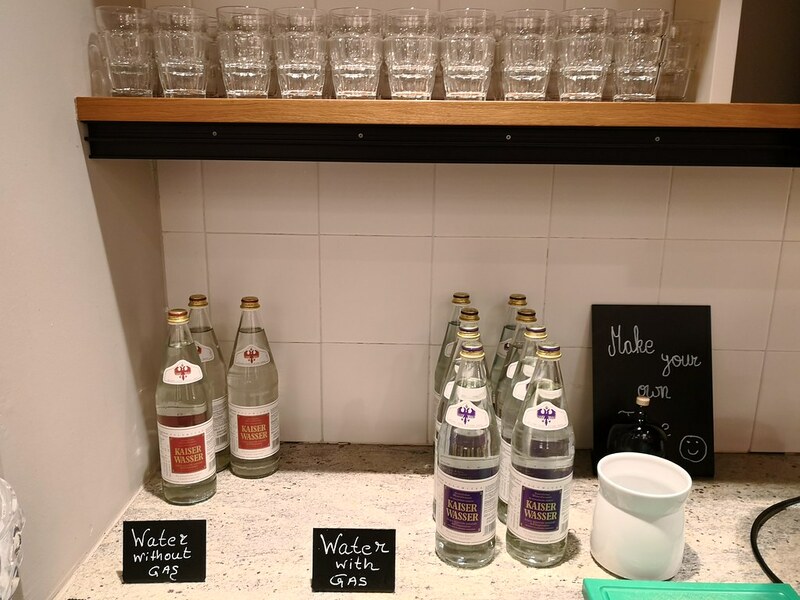 Still and sparkling water from the bottles can also be found along with soy milk for the lactose intolerant. Aside from the dining outlets, the hotel has meeting rooms on the second floor catering to the business crowd. 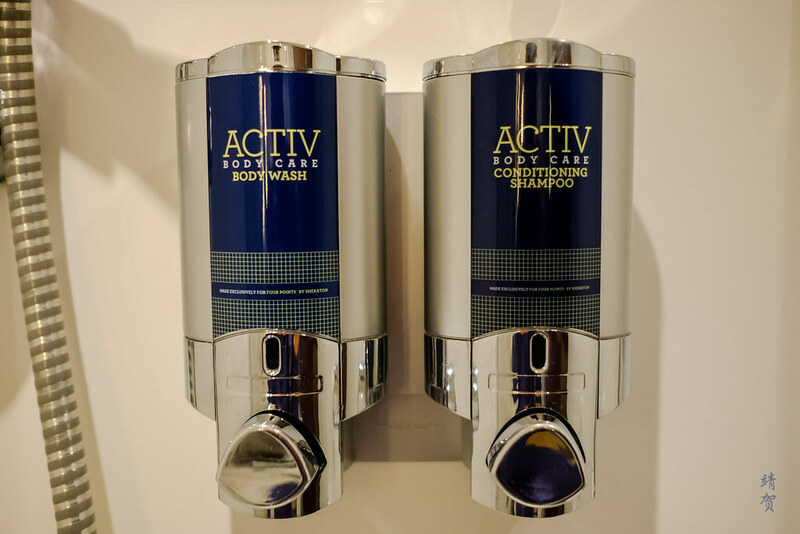 These would be popular during the convention season as the hotel is connected to the neighbouring convention centre. 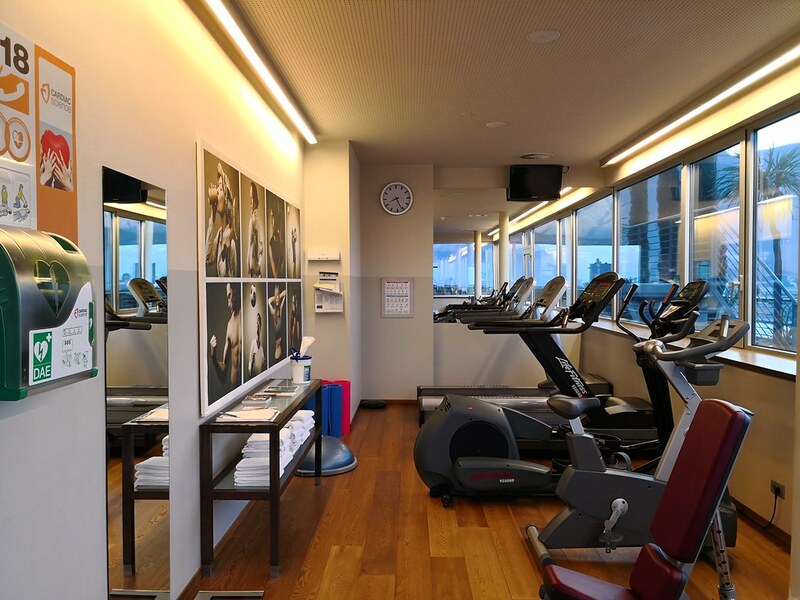 On the 7th floor lies the highlight of staying at this hotel as it is where the indoor swimming pool, fitness centre and spa is located at. 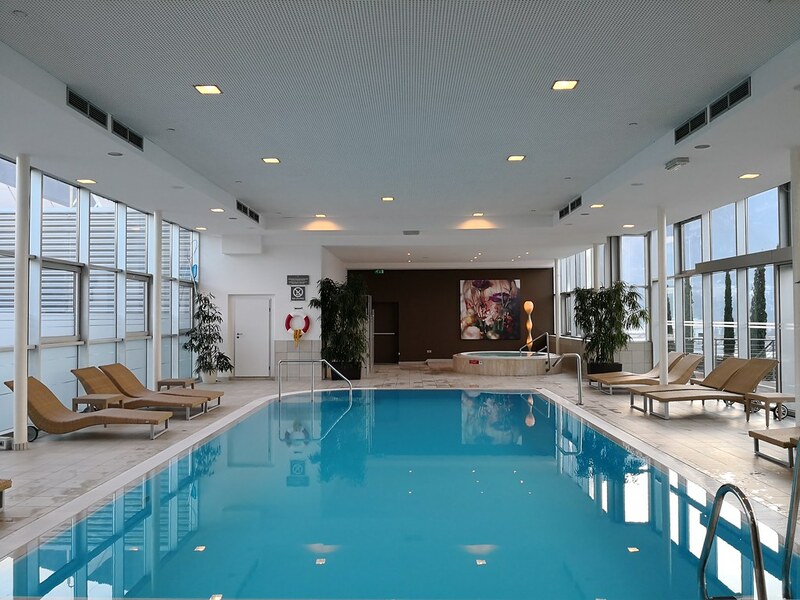 The indoor pool has glass windows surrounding it with great views of the mountains around Bolzano. 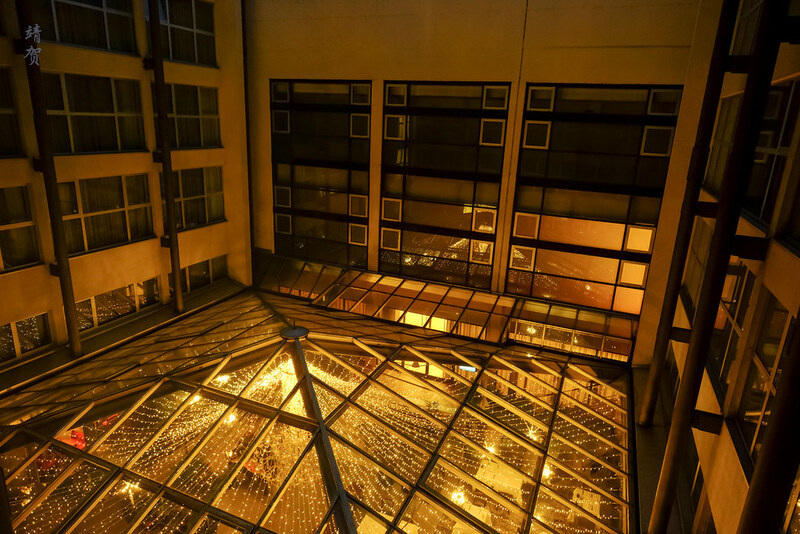 Since the hotel is also one of the taller buildings for miles, a great view is guaranteed here. 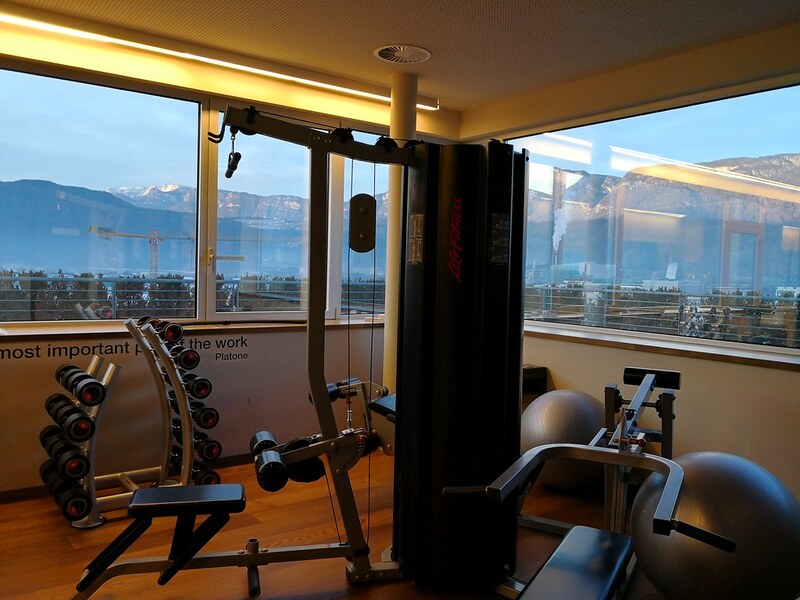 The fitness centre, while small, still has the same great views and is adequate for a short workout. There was a couple of treadmills, cycling stations and some rowing/pulling machines for short cardio routines with a set of weights. 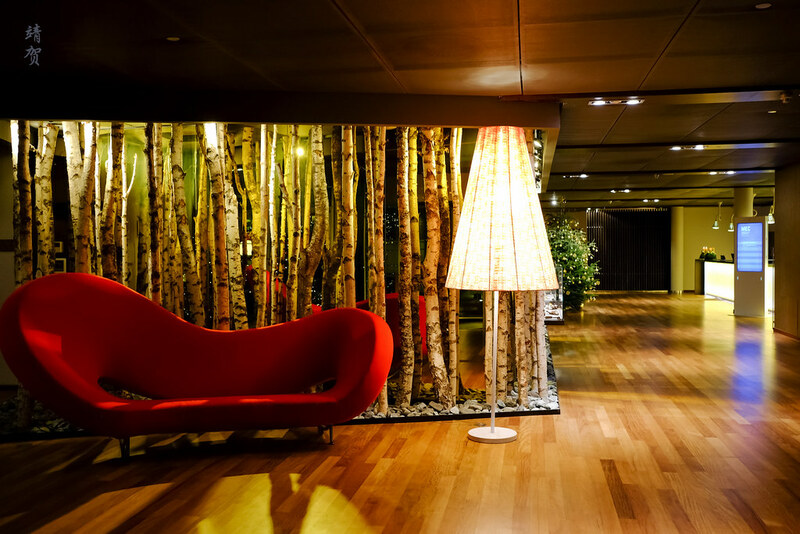 With the name of 7th Heaven for this floor, the spa is truly great. 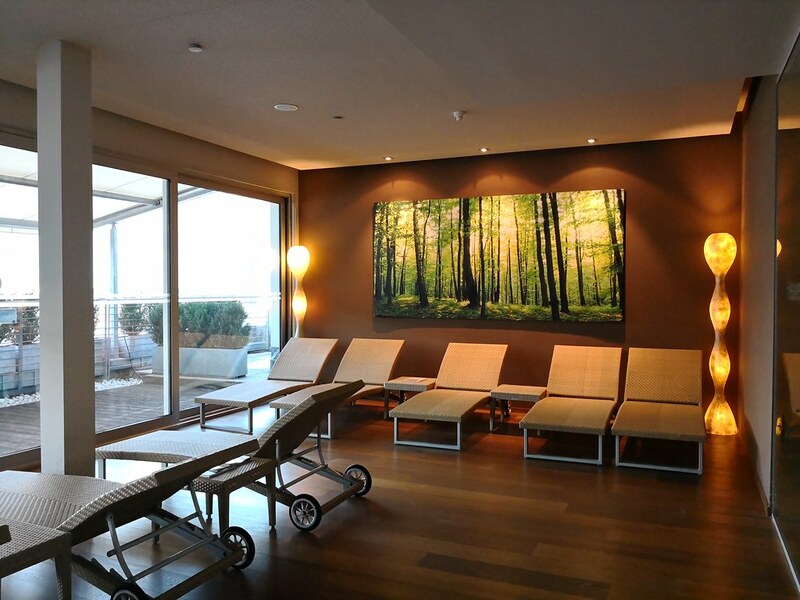 There are 2 private treatment rooms for guests requiring a massage, and a large lounge with several lounge chairs to relax in. 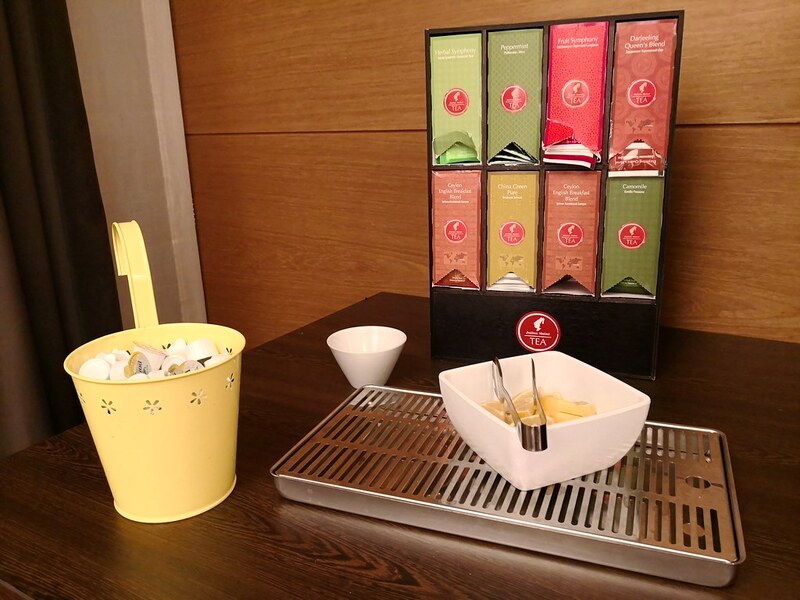 Hot tea is provided during the winter in the lounge while the adjoining spa has several saunas complete with shower stalls. This is quite respectable considering this hotel does not really market to a leisure market. In fact the decent prices for a massage also meant I tried one of the treatments and it was great after skiing in the Dolomites! 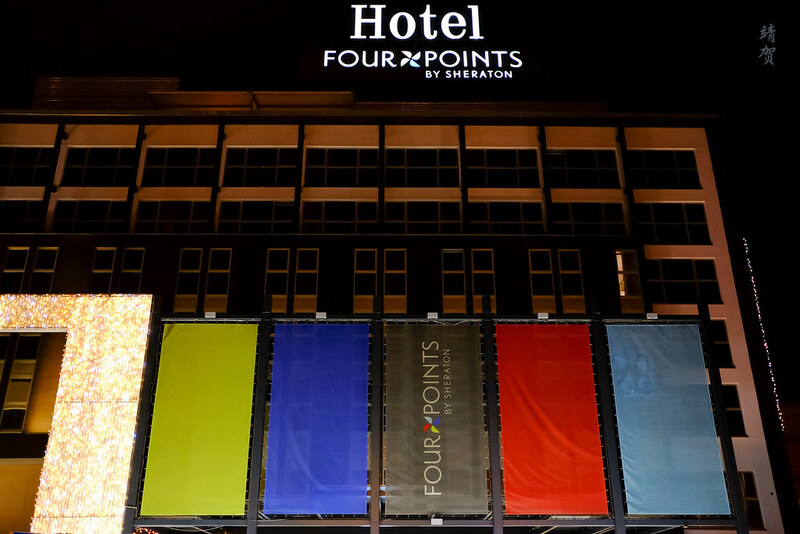 With a redemption rate of 3,000 Starpoints for a free night, I thought it was a good value redemption for the great breakfast spread and the upgraded suite. Service by the staff was very cordial and the young staff are helpful when asking for assistance. Even though the hotel is not located in the middle of the city for access to the sights, it was a great place to stay for me as I was spending a day to explore the Dolomites from here which is less than an hour away by car. As I was staying here before Christmas, I got to enjoy the Bolzano Christmas market as well which is definitely a highlight of my trip. 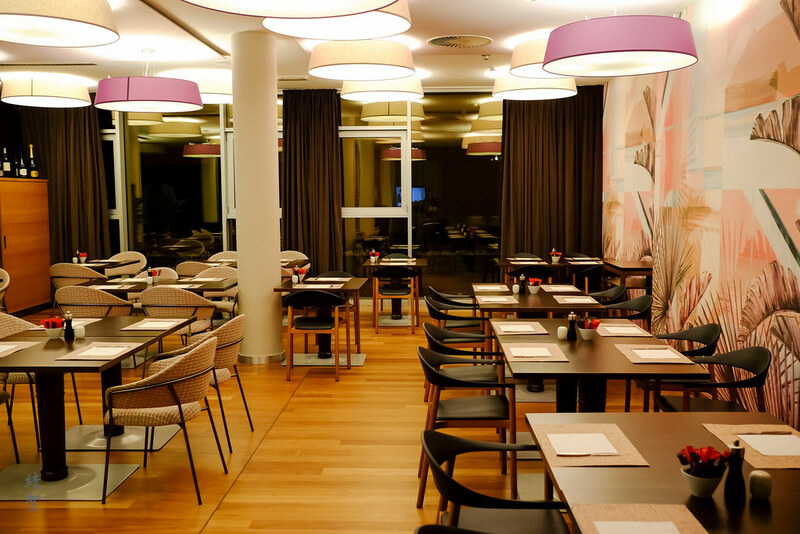 Even with the paid rates, I still found this hotel to provide remarkable value and would recommend it for visitors intending to explore the Dolomites, when visiting Bolzano or even for a transit stop between Milan and Innsbruck.